"No sugar in this recipe, but I promise you won't miss it. You can find agave nectar in health food stores. Also makes 20 great tarts." Whisk water, 3/4 cup agave nectar, cornstarch, flour, zest and juice from 2 1/2 lemons, and salt together in a saucepan; bring to a boil just until lemon mixture coats a spoon, 3 to 5 minutes. Stir butter into lemon mixture until melted; remove saucepan from heat. Whisk 1/2 cup lemon mixture with the egg yolks in a bowl to temper the yolks. Return saucepan to medium-low heat and slowly whisk tempered egg yolks into remaining lemon mixture until thickened, 3 to 5 minutes. 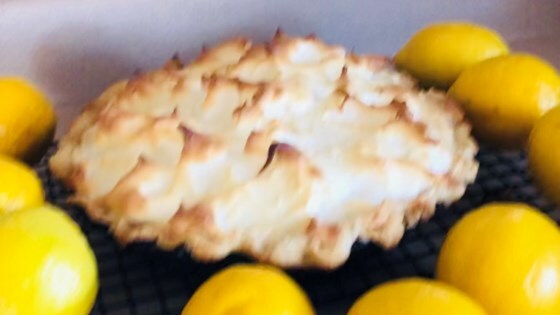 Spoon lemon mixture into pie crust. Beat egg whites and 1/2 teaspoon lemon juice in a clean bowl using an electric mixer until soft peaks form; add 2 tablespoons agave nectar and continue beating until stiff peaks form. Spoon egg white mixture on top of lemon mixture, making sure to completely cover the lemon mixture. Bake in the preheated oven until meringue is golden brown, about 10 minutes.